Successfully Added Rearview Parking Aid Kit - Camera + Monitor to your Shopping Cart. 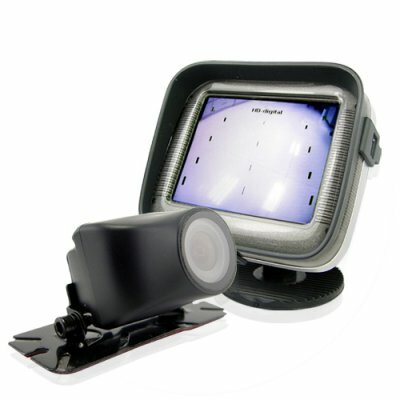 This fantastic rear view CMOS camera and monitor kit will ensure you can park and reverse safely. The camera is small and provides a crystal clear color video signal to the 2.5 inch TFT LCD monitor. The small unobtrusive monitor is mounted on a swivel base that enables it to be moved to the most ideal viewing angle for you car. Reversing and parking are made easy with a wide view angle (120 degrees) camera and a monitor with an intuitive parking reticle. An ideal solution if you do not already have an LCD screen in your vehicle. Another great product covered by Chinavasion's 12 month warranty and available now direct to you at wholesale prices or to your eBay customers via drop-shipping. Note: This product is currently only available in the NTSC Version. Please note this camera's output won't be compatible with an auxiliary PAL monitor.